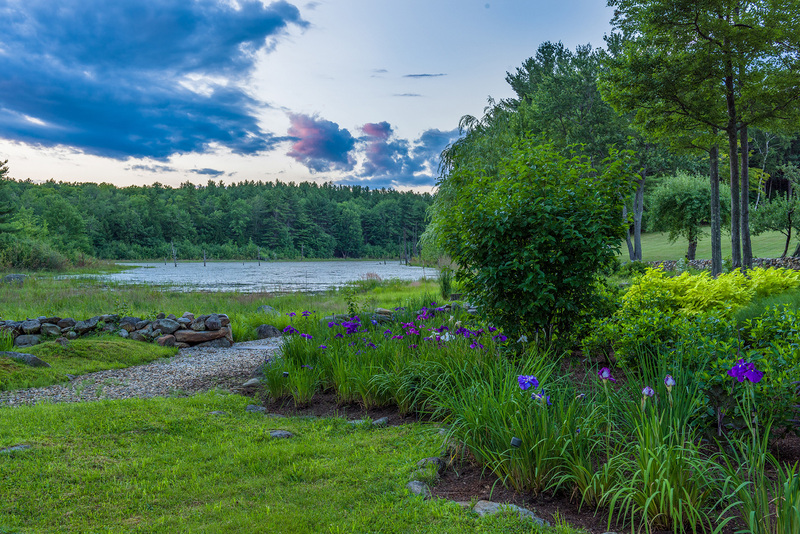 Louisa Thoron’s gardens in Jaffrey are her personal works of art, with many of her ideas coming from the site. 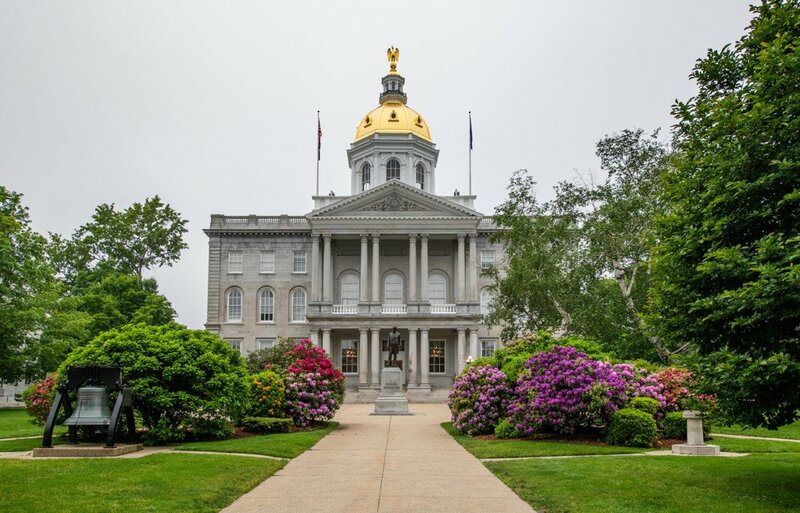 The view of Mount Monadnock in the distance, illuminated by the setting sun, can be savored from many vantage points both inside the house and out. She purchased the neglected 230-year-old Cape, located on 103 acres, in 1998 and began renovations the next year. “It was a total dump,” she says. The original center-chimney Cape had been added onto several times, and there was an old barn on one side. The house needed to be raised up so a basement could be put in for support, and the attached barn was razed. Thoron retained many of the old features of the classic Cape, including wide pine floors, wainscoting, hand-wrought hardware and windows with wavy glass. A sunny great-room addition with attached screened-in porch takes the place of the old barn, and a new kitchen makes the house even more inviting. It is a home for relaxed living and a haven for her guests. The overgrown vegetation and underbrush that had encroached around the house was cleared away. With plenty of windows to let in light and allow views of the property from every room, it is easy to make the transition from indoors to the outside. The interplay of colors— ranging from lime green to black, pink to red, and purple to orange—is provided by papyrus, begonias, coleus, zinnias, marigolds, angelonia, scaevola, fuchsia, heliotrope, lantana and colocasia, to name just a few of the plants found in the seventy-plus pots stationed by the back door. Once the house was livable, Thoron turned her attentions to the landscaping. 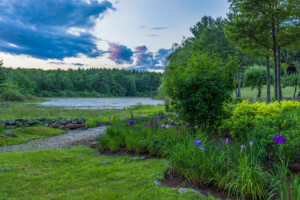 The property offers a bit of everything—rolling hillside, open fields, woods, a beaver pond with ten acres of wetland and a spectacular view of Mount Monadnock—the ultimate borrowed landscape. Using an old map from 1930 as her guide, Thoron was able to clear the overgrown acreage back to the original stone walls. The only plants worth saving were some old apple trees and a rhododendron. One of the apple trees has been struck by lightning twice and now has a metal rod inside it for support. 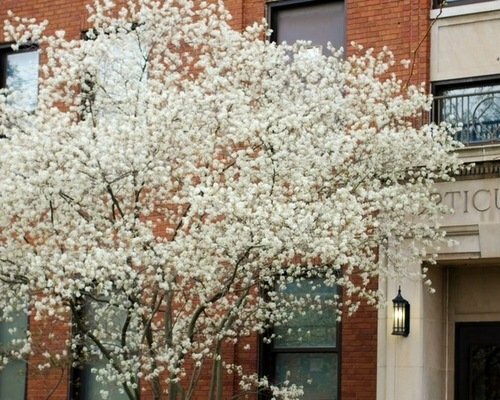 Close to the house, the tree is underplanted with red astilbe and two clematis vines twine lovingly around the tree, one a deep red and the other a double flowering white. Early on, Thoron enlisted the aid of two well-known landscape designers to help with the gardens around the house but found that her ideas often clashed with theirs. “We used to spar,” she says. “They love straight lines, and I love curves.” Although a physician by profession, Thoron is an artist at heart with an amazing eye for color and composition. She now has sixteen gardens covering two acres and more to come. To the left of the driveway is a rolling meadow planted with wildflowers and twelve thousand daffodil bulbs that put on quite a show in the spring. Climbing hydrangeas clamor along the stone wall, and a weeping crabapple that shares her name, ‘Louisa’, is planted at the corner where the driveway takes a turn toward the house. 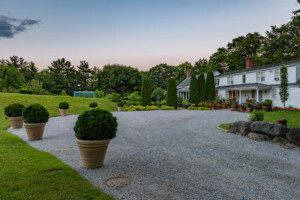 The circular parking area is cut into the hill behind the house, but Thoron has softened the imposing edge with nine large pots of mini-arborvitae. 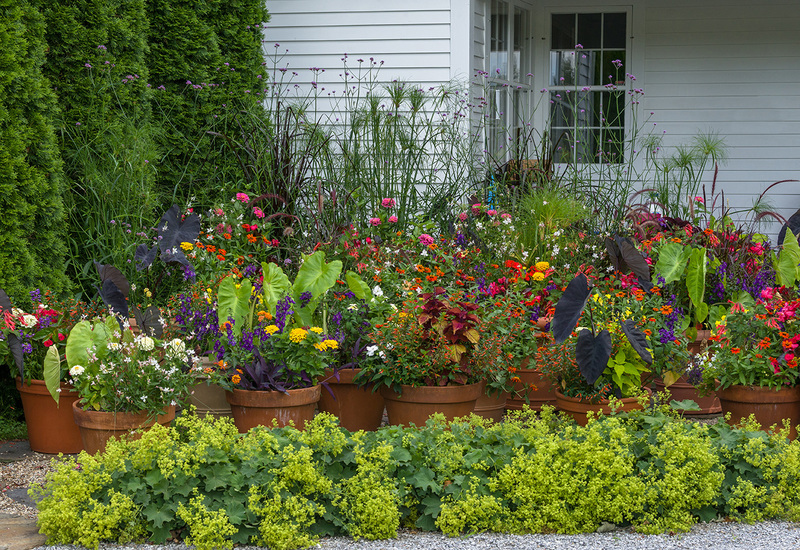 Visitors are welcomed at the back door by a dazzling array of seventy-plus terra-cotta containers planted with colorful annuals and tender perennials. “It was a very green garden and needed a burst of color,” she says. A tall, cedar hedge at the entrance to the back yard hides the gardens from view, its opening a threshold to the personal space beyond. 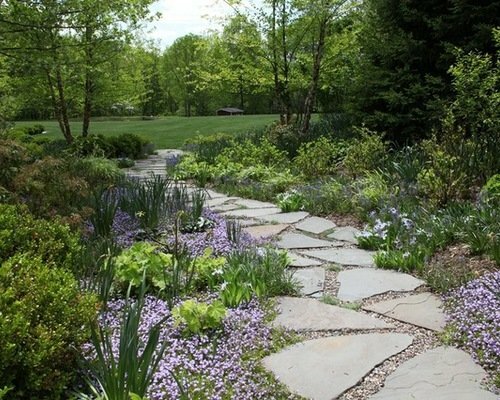 Here a brick path—inspired by Thoron’s visit to Great Dixter in England—runs the length of the house, and is richly planted on both sides with boxwood, peonies, penstemon, blue salvia, crocosmia, acanthus, irises, calendula, cannas and much more. 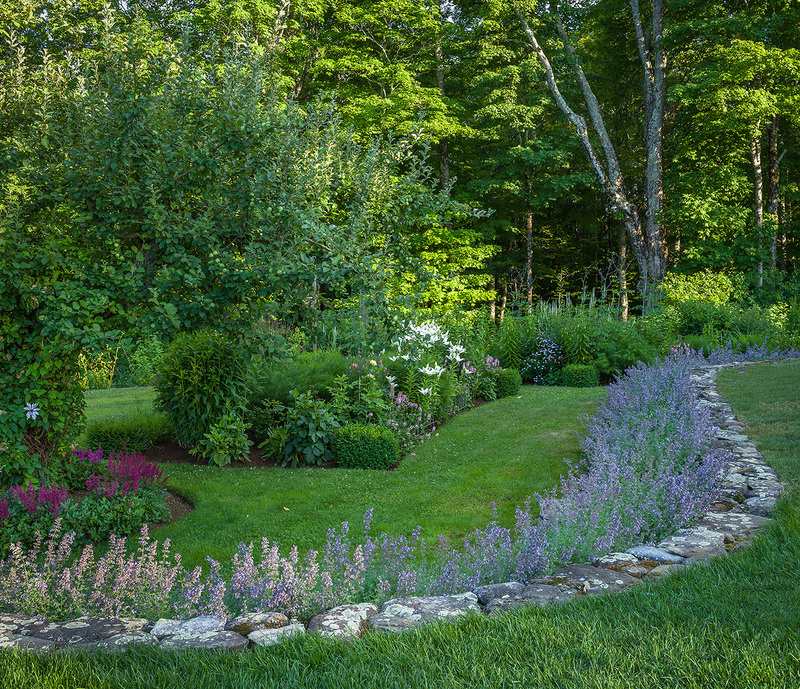 A retaining wall built using stones from the old barn foundation holds back the hill behind the house, creating a two-level garden with flowers below and vegetables above. Granite slabs from the foundation are used for steps cut into the hill, leading to the vegetable and cutting garden at the top of the knoll. Designed with four quadrants forming a Celtic cross, this garden is ornamental as well as practical. Multi-colored lettuces are planted in a starburst pattern. Yellow peppers, purple cabbages, red onions, rainbow chard, artichokes and beets are grown as much for color as for their flavor, and dahlias and peonies grow alongside them for cutting. “I let some of the artichokes bloom,” Thoron says. “They have beautiful soft purple flowers.” Tomatoes are protected by an enclosure covered with quarter-inch wire mesh to keep the crows that nest nearby from destroying the developing fruits and deter tomato hornworms from defoliating the plants. On one side of the house, a new septic system was a major alteration that left a scar. Here Thoron planted a pair of curved garden beds full of lilies, phlox, dahlias, white roses, blue star amsonia, gas plants and red astrantia major, facing a curved retaining wall planted with blue nepeta. 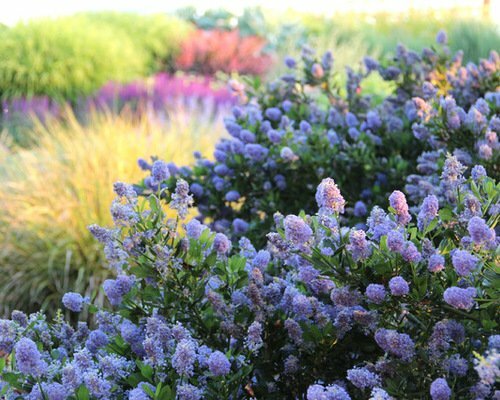 “I saw something like this in France, so I call them my French gardens,” she says. 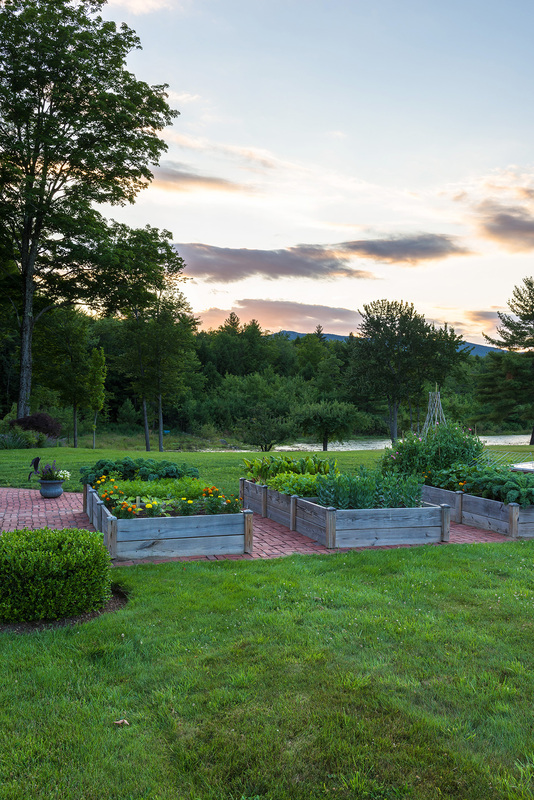 Next to the house is a kitchen garden filled with herbs. “This space is much loved by everything that gets planted here,” Thoron says. Sunny and sheltered, it is conveniently located by the door that led to the original kitchen of the house—now a repository for garden books, vases, clippers, hats, gloves and seeds, just steps from the new kitchen. Yellow and white Asiatic lilies, maroon-leaved smoke bush, white hydrangea, red poppies, blue nigella and orange ‘Profusion’ zinnias fill this bed along the driveway where it branches off from the house toward the barn. 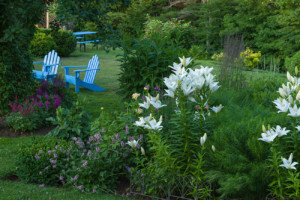 Around the front of the house, a deep bed broken only by a blue gate is backed with rhododendrons, viburnums, Japanese maples and magnolias obscuring the nearby road. In front of it is Thoron’s ligularia collection. “I planted every kind of ligularia I could get,” she says. 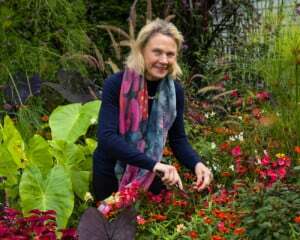 This includes large-leaved ‘Desdemona’; spiky, yellow-flowered ‘The Rocket’; and ‘Britt-Marie Crawford’ with its dark maroon foliage and orange daisy-like flowers. Japanese painted ferns, epimediums and pulmonaria also thrive in this shady roadside garden. 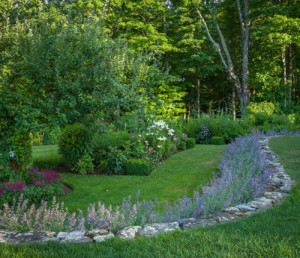 The border winds back to the sunny gardens where there is a gazebo with a garden of boxwood in front and a small grove of river birches to one side, offering a quiet place to sit and meditate on the view. Roses are planted everywhere! There are red climbers growing on a trellis attached to the side of the house. 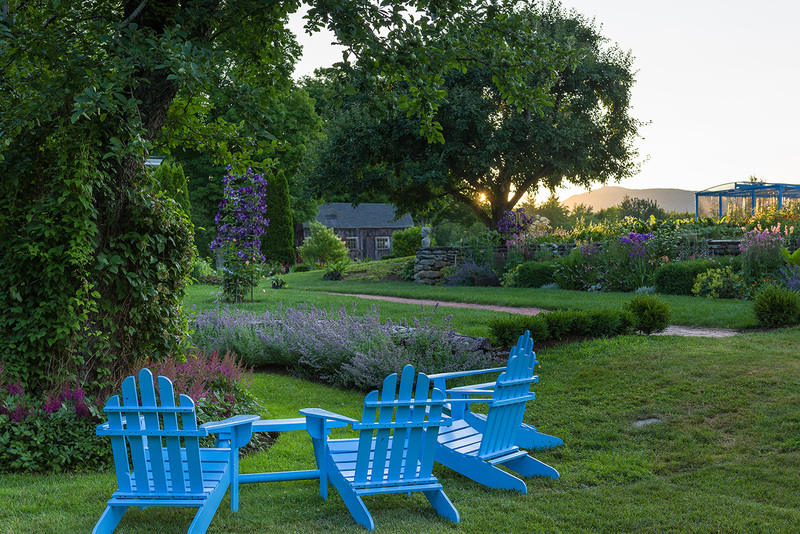 Twin beds of Knock Out roses flank the steps leading to the vegetable and cutting gardens, and more climbers include ‘William Baffin’ and ‘New Dawn’ grow along a cedar fence near the orchard. There is a formal rose garden designed in four parts echoing the Celtic cross of the vegetable garden opposite. 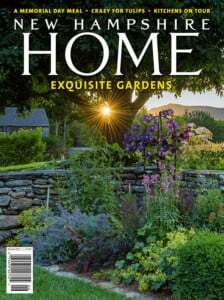 Each bed is enclosed with miniature boxwood edging and planted with fragrant David Austin shrub roses blossoming in shades of pink, apricot, yellow, white and crimson—nine plants per quadrant. 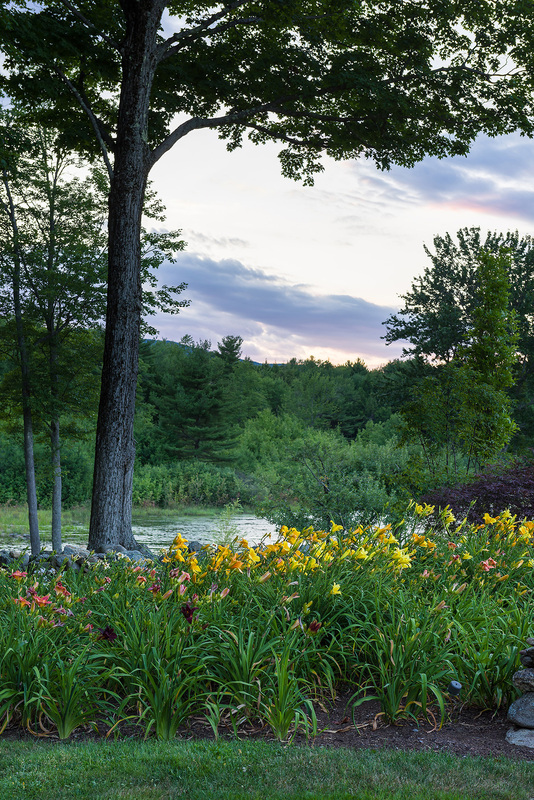 From the orchard on top of the knoll, the vista opens to include the woodland gardens that flow downslope from the barn toward the beaver pond and wetlands, with Mount Monadnock as a backdrop. 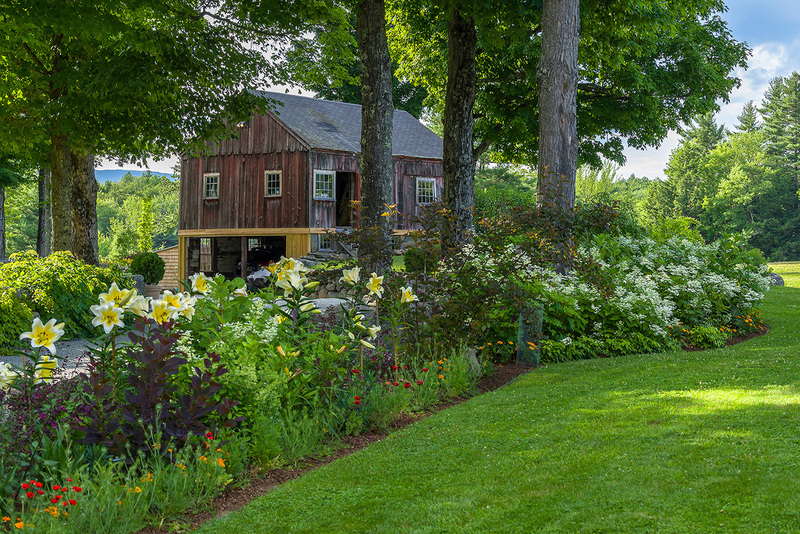 On one corner of the barn, lilacs are surrounded by yellow-leaved spirea, red physocarpus, meadow rue, yellow verbascum, Montauk daisies, yellow giant scabiosa, dahlias and dark-leaved cannas. Behind the barn, there is a utilitarian vegetable garden with raised beds, cold frames and another enclosure covered with wire mesh to protect broccoli and other brassicas from the destructive cabbage moth. Thoron calls this the working garden since it produces much of her food. The woodland garden was just a thicket in 2004 when Thoron began work there. Certified arborist Dan Tremblay, of Broad Oak Tree and Shrub Care in Peterborough, marked the trees to keep and thinned out the rest, making room for planting. Shade-lovers—including epimediums, tiarella, Japanese anemones, hellebores and variegated Solomon’s seal—carpet the ground between the rhododendrons and tall maples. Most of the stones used here for walkways and edging came from the old barn foundation. “We might as well use what’s on the place,” Thoron says. 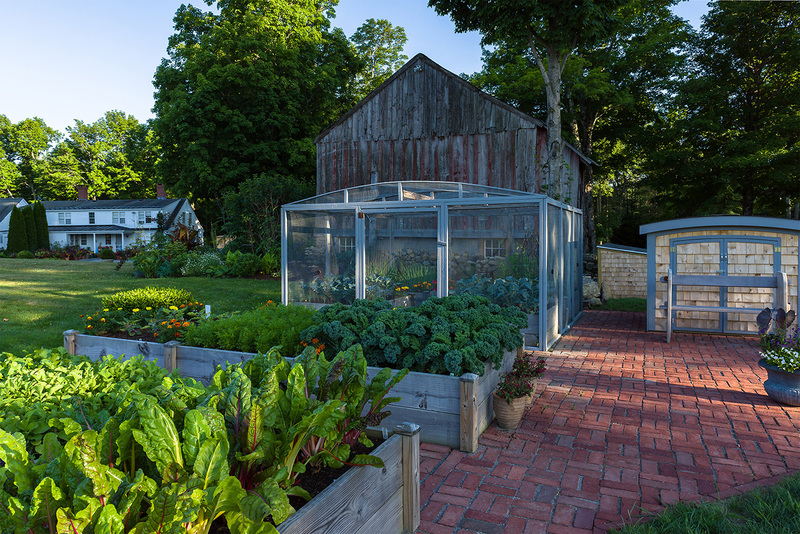 Thoron likes to share her garden and has opened it to the public in several different ways. 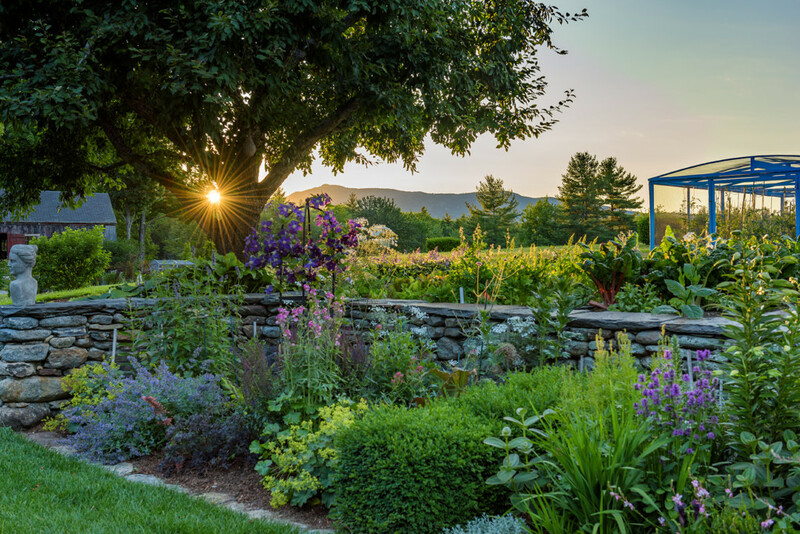 What better setting could there be for Monadnock Music to hold a concert than in a garden with a view of Mount Monadnock? Thoron has offered her garden to them again this summer—check their website (monadnockmusic.org) for details. Last year, she participated in the Garden Conservancy Open Days program, allowing fellow gardeners to see what she has cultivated over the years. To get kids thinking about where their food comes from and engage them in garden-based activities, in the future Thoron would like to invite the schoolchildren involved in the Cornucopia Project to visit as well. The nonprofit seeks to connect people of all ages to real food and to each other with programs that range from school gardens to kitchens and community education, in order to promote the importance of food and agriculture to our health and the environment.